Nestled amongst picturesque woodland, Camping De Katjeskelder offers a quiet and peaceful environment for your camping holiday. The holiday camping site is close to scenic wetlands of De Biesbosch National Park, one of the largest protected areas in the Netherlands. You can book an unforgettable stay at De Kathesjelder with LuxCamp. This luxury camping site is in Oosterhout, North Brabant. Along with indoor and outdoor pools, the beautiful campground is close to picturesque cycling and hiking trails. Whether you are travelling with friends or your family, this is a destination ideal for nature lovers. Why Choose Camping De Katjeskelder? 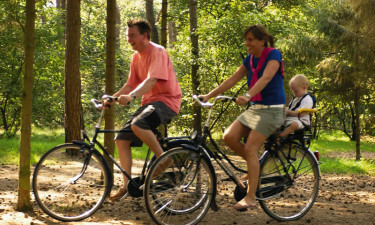 De Katjeskelder has an extensive sports and entertainment programme for visitors of all ages staying at the campground. This holiday camping site has inviting restaurants where you can eat from a buffet or order from the menu. There is also a snack bar for lighter meals and refreshments. Supermarkets also offer every essential item you need for your visit. After enjoying a bike ride or walk in the woods, you can cool down and go swimming in one of two pools at this luxury camping destination. You can swim indoors at the Tropikat pool or outside at the Katjeskelder pool. Whether you are staying in a mobile home or tent, you will have free Wi-Fi access during your camping holiday. 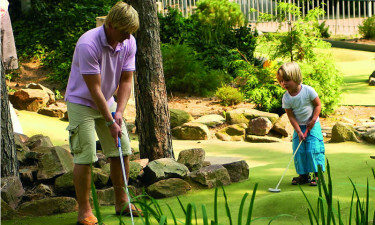 There is a mini-golf course, billiards, bowling alley, and other great facilities to keep you entertained during your stay. Other perks include a charging point for electric cars, laundry facilities, and a supermarket.